DES Electrical Contractors have been designing and installing Grid Connected Solar Systems for over 14 years. During this time we’ve installed residential and commercial systems of all sizes from 1 kW to a huge 580 kW. We have experience with many panel and inverter manufacturers and use only the best quality products. Contact us if you are interested in a free no obligation quote. A micro inverter AC system has a micro inverter attached to each panel on the roof, no single inverter on the wall. Each panel is one complete solar system so if you have 20 panels you have 20 independent systems. One panel will not affect any other panel in the system (so shade one panel it only reduces that panel only, if a micro or a panel fails it will only turn off that one panel - not the rest). It's safe low voltage DC power on the roof (max 37 VDC) and 240v AC power on the roof is protected by a circuit breaker in your switchboard. These systems have the ability to have multiple AC power feeds back to your switchboard (rather than one only on the above systems) therefore it can be connected to both power tariffs in your home (light & power and hot water/hydro heat) where the DC solar system can only be connected to one tariff only. These systems also have power generation and consumption monitoring included so you can actually see how much power you are using at any time. 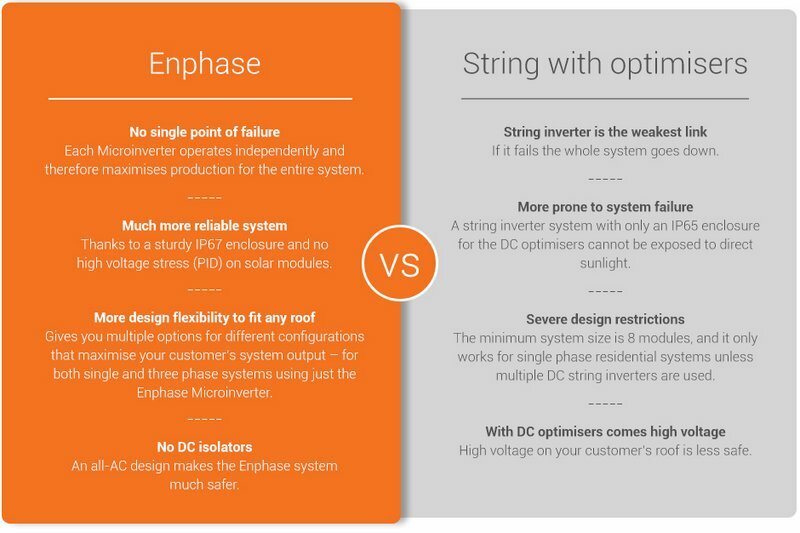 ​DC Solar systems have been around for a long time, and we have installed hundreds, in the past 6-7 years these have almost become obsolete with newer micro inverter technology taking the lead. (150-600 VDC) power to AC power. Many competitors still sell these types of systems, do your homework and check out micro inverters before you invest. Many of our Enphase solar systems are viewable online, this page shows you where we have installed the systems and how they are performing. We can also add additional solar to your existing solar system regardless of age as well as converting most solar systems to a hybrid / full stand alone system.